Helping organisations and individuals organise and improve their communication processes through analysis, project management, mediation and training. You can't solve a problem from the same level of thinking that created it. Designed and taught lessons to children (ages 9 - 12) on creating and building their own websites. Campaign to inform and educate the general public in Ghana about the importance of the proper recycling of electric and electronic scrap. The campaign includes an animation, a website and a Facebook page. Prioritising Tasks - Urgent or Important? So how can we prioritise our to-do list properly then, and work more efficiently? One tool to help might be the Eisenhower Decision Matrix, shown in the image. A few simple steps (my adaptation of the prioritisation method) can help you take control of your task list, as I explain in this post. The first thing that’s important to distinguish is the difference between Urgent and Important. People often confuse the two or think they are the same thing, but they are quite different. Importance describes how much a certain task will contribute to your overall goals and objectives, whether it’s advancing your career, completing a project or getting new contracts. Something that will have no effect if it doesn’t happen is simply not important. Urgency describes how soon something has to be done before it becomes “too late”. Some things can be done two days from now, and the outcome will remain the same, whilst others (like paying your taxes on the deadline) need to happen NOW or it’s simply too late. Once you understand the difference between urgent and important, you can start categorising your tasks. For each task on your list, grade it both in terms of urgency and importance, from 1-5, with 5 being the highest importance or urgency. For example, if you have a task to apply for your dream job, and the application deadline is this afternoon, it would get a 5 for both categories. If the deadline is in 2 weeks, you can probably give it a 5 for importance, and a 2 for urgency. Next, plot your tasks in the matrix shown in the image. The last step is deciding what to do with each task, and this is made easier by dividing the graph into 4 quadrants, with each quadrant having its own “prioritisation rule”. Note that this is my personal adaptation of the method, and I suggest you adapt it to fit your own situation as well. Quadrant 1 “Do Now” – This is the quadrant you do not want your tasks to be in. It’s a stressful quadrant where tasks cannot wait, and as the title suggests, these are tasks that are the highest on your list of priorities. Get them done now! Quadrant 2 “Schedule” – This quadrant contains items that are important, but they’re not urgent yet. So make sure they don’t become urgent! Schedule them in now, so you can get them done before they do. These items go second on your list of priorities. 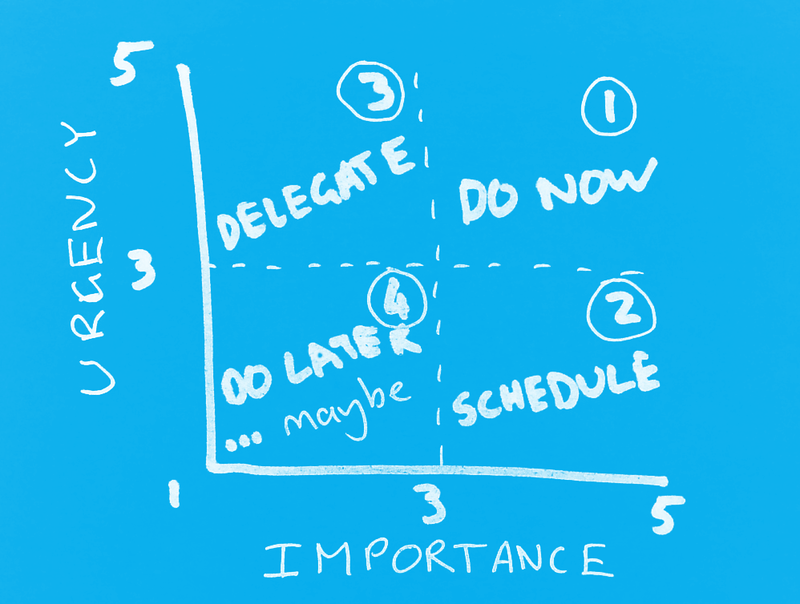 Quadrant 3 “Delegate” – These items are urgent, but they’re not very important for your own goals. This often means you can delegate them, because even if they go wrong, the impact on your goals are minimal. If you cannot delegate in your situation, then schedule them for yourself, but lower than the items in quadrant 2. Quadrant 4 “Do Later” – This quadrant contains things that maybe should not even be on your list. They are items that are not important to your goals, and are not pressing to happen. Add these to the bottom of your list, and if you never get to them, too bad. Chances are, nothing will go wrong if you don’t do them. Now of course there are exceptions to these items, and there are considerations when items fall in-between quadrants. In this case, use your common sense and your own discretion when prioritising. Next time you’re busy with your to-do list, try using these tips, and watch how your tasks seem so much more manageable. You might even be surprised at the number of things on your list that are simply not necessary! You can be more effective! You can be happier! With these 7 habits you can be successful! These are all slogans books have that claim to help you be better, more efficient and happier. And the truth is, most of these books have very valid points, if you can incorporate the tips into your life and workflow. But in the end, they all talk about success. Though it might sound like it, I am not specifically trying to promote this book, nor do I have any financial interests in it. I'm just a fan of Scott Adams and his work, and thought I'd share my thoughts! The book was simple to read. It is full of short stories of Scott’s own experiences, and how he dealt with them. Every now and then he gives some reference to back his ideas, but in general the book is just full of common sense (some say the least common of the senses…). So if it’s full of common sense, why read, or even buy it? Because you don’t realise these things until you read them in a book. It awakens things in your mind that you don’t really realise are there. And then it makes you think, and it makes you recognise situations in your own life where his tips might apply. And that’s basically it. There’s no grand story here, and life-changing tips or Nobel Prize winning ideas (though he’d love to win that one day). Just common sense that’s very worth reading. Scott goes into various different aspects of his life, with a big focus on eating and living healthy, and how that can lead to a better life in general. There are a few chapters on weight loss and the systems (rather than goals) that can help. Scott did a good job on relating healthy eating to other aspects of your life which I found very interesting. So whether you’re just curious, whether you’re looking for any tips to be more effective, or whether you want to lose weight, I suggest you pick up a copy of this book, and enjoy it! What’s the most important thing for any business? Customers! Everyone knows that right? Sometimes you’re about to “be a customer”, and you know you’re in for a treat. And often you’re not disappointed. Then there are the times when you just know you’re in trouble and this will not be a pleasant experience, yet you still go ahead, and unfortunately, you’re usually right. I ordered a mobile charger for my holiday in South Africa, and received it perfectly on time. Unfortunately half-way through my holiday, it broke. So on New Years’ Day (A holiday mind you), I contacted Amazon through their chat support, and explained my problem. Without needing any proof, without asking complicated questions such as “Did you drop it?” or “Could it have come into contact with water?” they said they would refund it. The next day I had the money back in my account to buy a new one. Very often these culprits are mobile phone or internet providers. People often say it’s because of the size of the company and because you’re “just a number” but that’s no different from Amazon (Amazon: $75bn revenue, Vodafone: $72bn revenue). I’m obviously going to use my mobile phone experience as a bad example. The short version is that I was wrongly informed by an employee of Vodafone that I deserved a 4G phone as a replacement, and not 3G, since it’s otherwise not “comparable”. So they sent me a new phone, and when it arrived, the courier (A Vodafone employee) advised me to refuse the package, since the phone was the same as I already had, not solving my problem. So I refused the package, and suddenly received a €50 addition to my phone bill. Vodafone refuses to credit this €50. So it seems that to a company such as Vodafone, €50 euros extra revenue is more important than a satisfied customer. And that baffles me. In this day and age of internet and social media, how can companies sill not understand how important it is to keep customers happy. Find customers with honest marketing. Keep the customers happy by exceeding their expectations. When they have a problem, HELP THEM. Assume they are right when there is a dispute, do not assume it’s their fault. Give your customers the tools to promote for you. This works if they have good service. Of course this is no definitive list, but simple tips any company can follow. And it all comes down to communication. Do you teach your operators that they should save the company money, or do you train them to keep customers happy? What would you want as a customer? Remember, without your customers, you have NO INCOME. 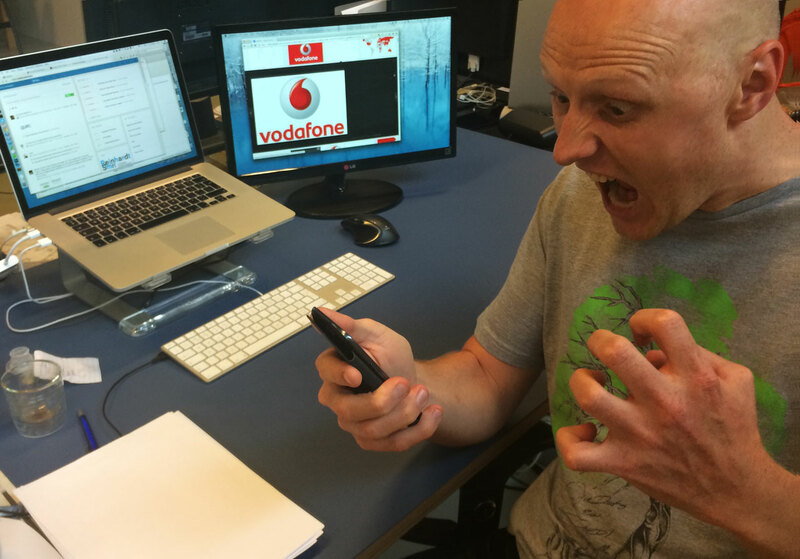 [Update] After sending an official written complaint, I was called by a Vodafone representative (a very polite and understanding gentleman) and told that the full amount of the extra costs will be credited on my next phone bill. Great that my efforts were not in vain!